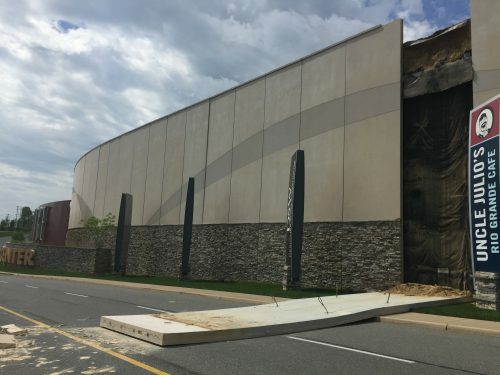 Last night, a large panel of the entry wall at Stonebridge at Potomac Town Center in Woodbridge fell down. The road is still closed off on either side to drivers and pedestrians, and the fallen wall panel is still laying in the roadway. “Due to a section of the wall falling we had to close the road from the main sign to the intersection by the apartments. We apologize for the inconvenience,” stated Stonebridge’s Facebook page. No businesses at the town center are closed as a result, and no one appears to have been hurt in the incident.